OK, OK. I know some of you will groan because it's an oldie but goodie. But when we started this blog we said it's intended as a showcase and repository for the best in Jewish humor, both old and new. So occasionally we run videos, films, jokes, and stories that are not hot off the press, but that can still bring a laugh or smile to start the day. So here it is: La Boda. A wedding in Israel where the photographer takes photos of groups with the bride and calls it as she sees it. 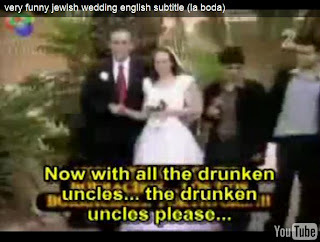 We've watched this many times to see if the subtitles are funny phony translations of her instructions in Hebrew. But after doing some lip reading, our conclusion is that the whole thing was staged and that she is really saying in Hebrew what appears as the English and Spanish translation in the subtitles. Enjoy!